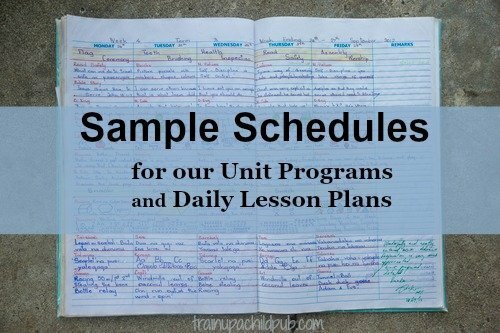 Below are sample schedules for our Unit Programs and our Daily Lesson Plans. Although we designed our Unit Programs with a specific schedule in mind, it is unstructured enough that you may use it on any schedule that you like. With both our Unit Programs and Daily Lesson Plans, history is broken up into nine units, from Creation to Modern. While most people have only studied history by topic, like you may have done in school, or in three or four year cycles, like many popular homeschool curricula, our curriculum is designed to study from Creation to Modern in one homeschool year. The schedule is repeated each successive year, and layer by layer, your children will be able to pick up and connect facts that they could not remember previously. This method provides a more thorough understanding and a better recall of the flow of history. But do you have to study history that way? With our Unit Programs, you do not. There are enough book suggestions in each of our components that you can study three units in a year if you want to. Just read all of the books listed instead of 1/3 each year. Want to travel down a rabbit trail? Or camp out in a historical period that your kids are really enjoying? Go for it! You can do that with our Unit Programs. All of our Daily Lesson Plans are on the same schedule, so you may choose to have all of your children study the same time period at the same time, just like with our Unit Programs. Can you use a combination of both programs with your family? Of course! In that case, many people choose to have everyone follow the Daily Lesson Plan schedule.